Abel Tasman Charters is owned and operated by Rod Stuart (yes! just don't ask him to sing), your other skipper is Emma. They are passionate about this special place in New Zealand and you'll find Rod and Emma's knowledgeable enthusiasm has captivated you by the end of your cruise. A local in the true sense of the word Rod was brought up in Kaiteriteri where his mother still waves a tea towel off the deck to the boats in the morning. 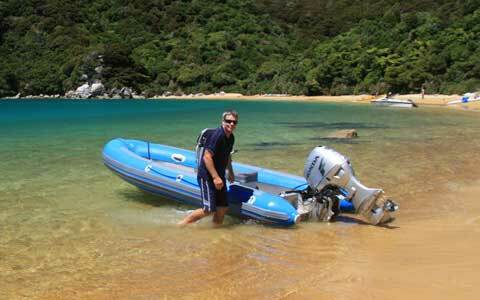 Rod's passion for the Abel Tasman is evident as he shares his piece of paradise with you. He grew up snorkelling, diving and boating every nook and cranny of the coastline, leading him to complete a BSc in Zoology at Canterbury University, to follow his passion for marine biology. After operating several local business and travelling around the world for a couple of years Rod grabbed the opportunity to run a tourism business, Abel Tasman Aqua Taxis, with Jane and Kelvin Goodman in 1998. This successful venture renewed his love of the Park and allowed him to showcase this amazing environment to world travellers. During this time Rod and Kelvin developed the design of the osprey boats used by the company, and supported the development of a marine reserve and the Abel Tasman Birdsong Trust. With the sale of Aqua Taxis in 2003 Rod and his partner, Karina established Abel Tasman Charters with the aim of providing a more intimate personal trip for travellers with low impact on the environment. This led to the purpose built Taranui, an 11 metre semi displacement power catamaran surveyed for 25 day passengers. The semi displacement hulls allow for greater fuel efficiency as well as providing a smooth ride. He'll be one of the skippers to greet you on your cruise. In 2014 we welcomed Emma Buscke (pronounced Bus key) as our new skipper at Abel Tasman Charters. Emma grew up in Ocean Beach, Hawkes Bay where her love for the sea, boating and great outdoors began. She studied Outdoor Recreation Guiding & Leadership at Christchurch Polytechnic and then spent a year in the USA in the Out Door Department at Appalachian State University, sharing her love for adventure with up and coming outdoor leaders. 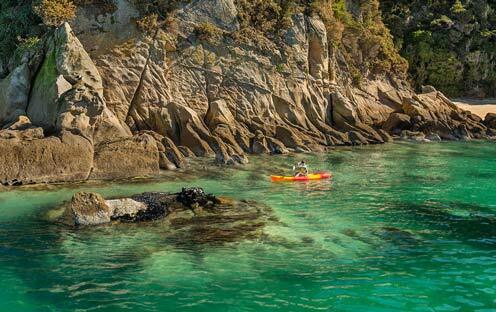 She fell in love with the Abel Tasman when she brought a group of American students back for a kayaking tour, revelling in this beautiful part of New Zealand, where she felt at home. Emma has extensive boating experience and a passion for the local landscape which has seen her train and work as a kayak and walking guide in the Abel Tasman National Park before obtaining her skippers ticket. This experience is evident in her extensive knowledge of the history, wildlife and ecology of the area and ensures she can cater to your area of interest on your cruise. Emma's friendly personable manner and highly professional attitude makes her a fantastic addition to our team and we are delighted to have her as part of the Abel Tasman Charters family. She looks forward to welcoming you on board and ensuring you enjoy your time in the beautiful Abel Tasman National Park. Tim grew up in the (cough cough) North Island of New Zealand in the small coastal town of Otaki, kayaking rivers, hiking in the Tararua Ranges and surf-lifesaving at Otaki beach. After several years of adventure and mis-adventure Tim studied Adventure tourism in at Nelson Marlborough Institute of Technology which led to a career start kayak guiding and as a ornithological guide on day hiking on Kapiti Island off the Kapiti coast of New Zealand. Tim’s passion for people is shown in his career as a long term guide in tourism and in his time as a teacher of primary school aged children in the Nelson area. Tim has been working in the Abel Tasman National Park for 15 years as a kayak guide, walking track guide and skipper on water taxis. Mac Stuart is a new skipper for Abel Tasman Charters this season and Rod and Karina’s eldest son. He grew up on boats in and around this stunning region and developed a passion for the outdoors. At a young age Mac enjoyed rock climbing and hiking with friends in the many mountain ranges of the Tasman area. Upon leaving school Mac left New Zealand to spend some time travelling mainly around Europe. 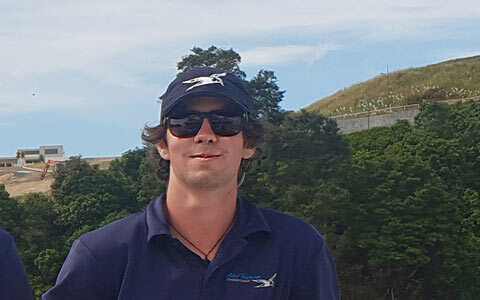 He had planned to return to study at University but realised how much he enjoyed sharing the Abel Tasman National Park with others and after a year as crew with Abel Tasman Charters studied for his Skippers ticket. He spent the next summer with Abel Tasman Aqua Taxis learning about the quick pace of life as a water taxi drive before a position as a skipper was offered to him at Abel Tasman Charters. Mac also began the first year of his engineering degree in 2018 at Canterbury University. 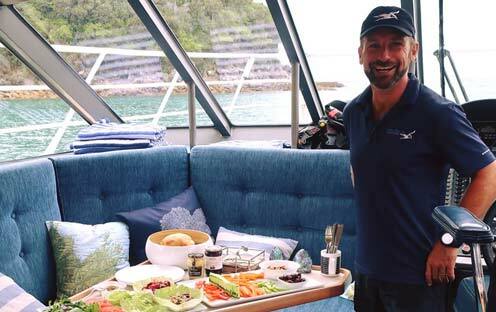 Karina and Rod are both delighted to have him as part of the Abel Tasman Charters team. Angus Stuart is Abel Tasman Charters only full-time crew and also Rod and Karina’s youngest son. 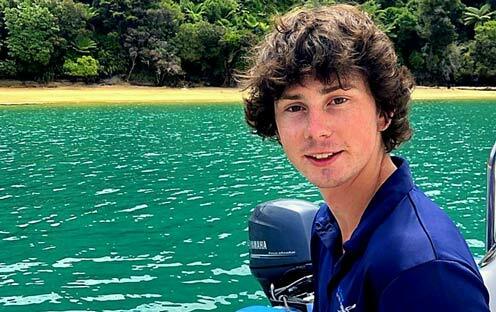 Angus has grown up around boats all his life and spent much of his childhood in and around the Abel Tasman National Park. He has a passion for the outdoors, enjoying hiking in the mountains and rock climbing as well as snorkelling and fishing. At the finish of High School Angus worked a summer season as crew and then spent five months traveling on his own starting in Turkey and making his way through many countries in Europe. He has returned for his second season as crew in the family business this year and Karina and Rod are thrilled to have him back as he is knowledgeable, friendly, hardworking and is a very capable first mate. Karina Amey is the office manager/occasional crew /chief towel washer and co-owner of Abel Tasman Charters. She is also Rod's partner and Mac and Angus' mother. Until 2 years ago Karina ran her own Landscape Design company in the Nelson area as she is a qualified Landscape Architect while also working within Abel Tasman Charters. She brings her landscape architect's experience to the Planting For The Birds project that Abel Tasman Charters are leading. 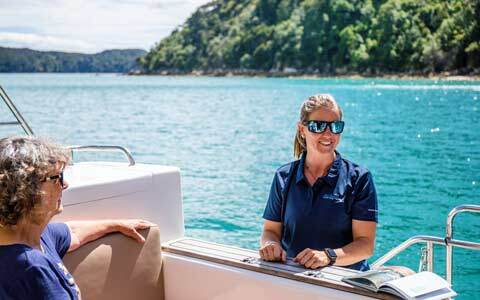 With the expansion of the boating business she decided it was time to have a change and is enjoying being a full time member of the Abel Tasman Charters team. Karina is also the driver for our vehicle transfers. Rod and Mac were phenomenal hosts on our day long tour of Abel Tasman! Their knowledge of not only the water but the history of the area was truly astounding. We shared the boat with 4 others and the whole group had a wonderful time! A special shout out to Rod's son Mac, who despite being only 19, was incredibly well versed in local flora and fauna. A very engaging young man whose enthusiasm for all things Kiwi was infectious. It was obvious to all onboard that both father and son take a great deal of pride in introducing their guests to their home.